2016 was an exciting year for our Green Clean Schools program. We hosted two first-ever events, announced a five-year partnership with ISSA, strengthened relationships with committed sponsors, met truly visionary school facility leaders through the Green Cleaning Award, and engaged with hundreds of new school facility directors. We’ve never felt more galvanized to continue educating and advocating for greener, healthier cleaning in schools and universities! This year, all of our programming was designed to help us build a network of school facility directors who are dedicated to protecting the health of their schools, staff, students and communities. As we look ahead to 2017, the momentum is bolstering our efforts to engage even more of you. We love it when we get to see our hard work pay off at our Green Clean Schools events. And in 2016, we had two chances to do so. The best thing about these events are when we get to meet members of our Green Clean Schools network in person, hear about their schools, listen to their ideas, and engage with them around a shared desire to make schools healthier. At the Green Clean Schools Leadership Institute in Maryland last July, we hosted more than 80 leaders at a two-day summit where we focused on issues of leadership in the field. We met many dedicated staff members from Howard County Public Schools, who hosted the event, and got to see a behind-the-scenes tour of how their award-winning green cleaning program works. We were truly inspired by how this team worked tirelessly to prepare their buildings for the tour, including their impressively organized custodial closets! At the Green Clean Schools Forum at ISSA/INTERCLEAN in Chicago this past October, we were thrilled to engage with close to 200 green cleaning leaders, meeting facility directors from small and large universities, big public schools systems and smaller private schools from all across the country. After a day and a half of in-depth panel presentations from green cleaning experts and members of our Green Clean Schools Leadership Council, we embarked on a guided tour of the massive trade show floor at ISSA/INTERCLEAN. 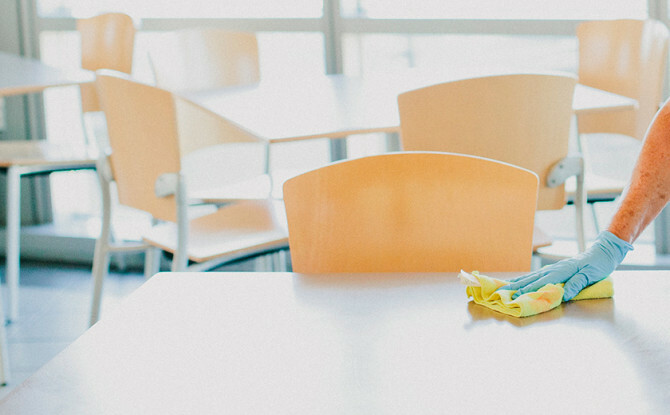 Our Leadership Council includes 10 devoted green cleaning leaders, most of whom are facility directors at schools and universities across the country. When we get together, the ideas for green cleaning flow and the passion for protecting student and environmental health is infectious. This past year allowed us to spend time with out Leadership Council at events, tap into their networks of committed leaders, and hear them present on topics ranging from the specifics of their programs to how they engage and motivate their staffs. We are so thankful for this group, and look forward to working closely with them in the new year to make more of their ideas come to life. As we plan ahead for some exciting events coming in the summer and fall of the new year, judge the 2017 Green Cleaning Award for Schools & Universities, and meet more school facility directors, we also welcome your input and engagement. Please send us an email, contact a member from our Leadership Council and attend an event. It takes leaders like you, on the ground, in schools and universities across the country to help push the green cleaning movement forward. We also want to thank our sponsors; we are so grateful for the generous support of industry leaders in the manufacture and distribution of green cleaning products and services.